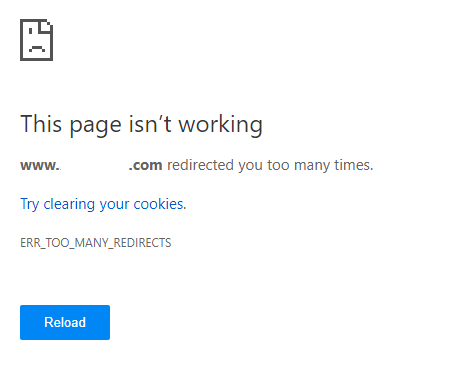 If you’re using CloudFlare CDN as the DNS and HTTP proxy, the following redirection error (the exact error messages may be different depending on which web browser is used – Google Chrome, IE, Edge, Mozilla Firefox, Opera etc.) may occur with you activate SSL under “Crypto” to encrypt communication to and from your website. An error occurred during a connection to www.domain.com. www.domain.com redirected you too many times. The error usually happens when the Cloudflare SSL setting, which determines how CloudFlare connects to the origin server for HTTPS requests, is set to the wrong option. By default, CloudFlare sets the SSL setting to “Flexible”, which allows CloudFlare to provide a secure connection between the visitor and CloudFlare using HTTPS for unsecured websites without SSL certificates that use CloudFlare as proxy. If your website already has SSL enabled with SSL certificate (including self-signed SSL cert) installed, setting the CloudFlare’s SSL option to “Flexible” will cause the redirect loop if the original web server also has a redirection setup to forward HTTP traffic to HTTPS. If you have SSL certificate, including self-signed SSL certificate, set the CloudFlare SSL option to Full or Full (Strict). Full SSL setting allows CloudFlare to connect to origin server via secure HTTPS connection without validation or authentication (allows self-signed SSL certificate), while Full (Strict) forces CloudFlare to connect over HTTPS and verify the SSL certificate validity (not expired and signed by a trusted CA or Cloudflare Origin CA). Remove the redirection set up at the web server that forwards HTTP to HTTPS (e.g. in .htaccess or Apache httpd.conf and etc.). If you are on an Apache web server, ensure that you have Mod_Cloudflare installed. If you use Nginx or Mod_Cloudflare does not automatically resolve the issue, ensure you have our official WordPress plugin installed.